The Minnesota DOT TAMP is available here. The Minnesota DOT TAMP serves as an accountability and communication tool and informs capital and operations planning efforts. 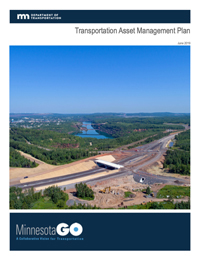 In addition to being a federal requirement, the TAMP is a planning tool by which Minnesota DOT can more thoroughly evaluate risks and develop mitigation strategies, analyze life cycle costs, establish asset condition performance measures and targets, and develop investment strategies. It formalizes and documents the following key information to meet federal requirements: description and condition of pavements and bridges on the NHS; asset management objectives and measures; summary of gaps between targeted and actual performance; life cycle cost and risk management analysis; financial plan that addresses performance gaps; and investment strategies and anticipated performance. The asset scope of this document is: Culverts, Highway Assets, Includes other highway assets, Sign Supports, Stormwater/Drainage.